A large student crowd cheered enthusiastically as Dr Bishal Dhakal, the entrepreneur behind Health @ Home, entered a small hall in National College of Information Technology in Balkumari. The banner on the wall with a photo of Maost leader Prachanda on one side and Marx and Lenin on another, sent out a mixed message. ANNISU (Revolutionary) had organized a one day interaction program to invite Dr Dhakal to share his expertise and experiences to inspire first year undergraduate students. The irony was not lost on us, but the event was an important one. Marx and Lenin grace the social entrepreneurship talk program. After junior Maoist leaders present to support the event presented their well rehearsed speeches, Dr Dhakal started with introducing his unique health care company. The entrepreneur had to quiet down the unruly students in the audience with a firm warning to respect their time. 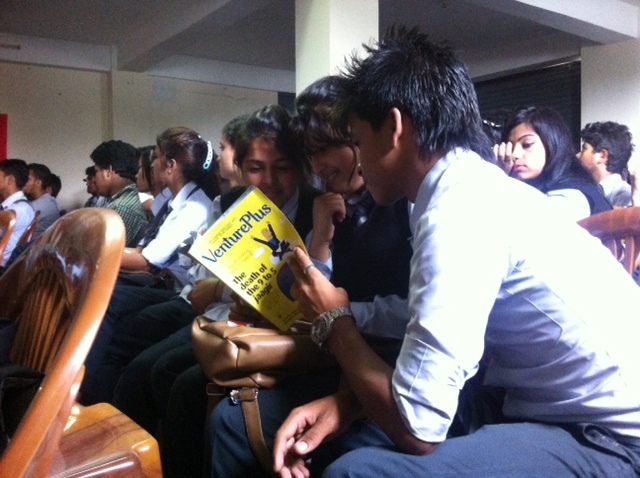 Over the next few hours, Dr Dhakal engaged the now quiet-er students in his experiences, how he gave up on a career as a cardiac surgeon, social and family pressures and about how it felt to win Surya Nepal’s Asha Social Entrepreneurship Award in 2012 (like he had passed a test and proved a point). 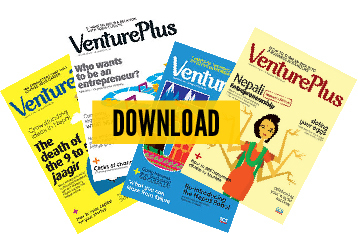 The VenturePlus team (invited by Dr Dhakal to the event) was tweeting about the happenings at the event as it happened while also circulating copies of our brand new magazine in the audience. The highlight of the event though was the surprisingly interactive Q&A section at the end. Dr Dhakal tireless answered a large number of questions, some of them recurring, often giving examples close to him. When a young student asked if he could do something while still in studying, Dr Dhakal shared the case of the other entrepreneur in his family, his own brother — F1Soft International’s Bishwas Dhakal — who during his college years was already designing software and websites. Coincidentally, both the entrepreneur brothers are graduates of NCIT. While some questions were purely inquisitve asking about the difference between social work and social entrepreneurship and then social entrepreneurship and entrepreneurship alone, a few were surprisingly smart. One young student asked about how he could connect his tech studies to entrepreneurship in the health sector while another asked about generating seed money through venture capital funds and other sources. A large number of the students were there possibly because the organizers had promised them “certificates” for attending the event, signed by Dr Dhakal and the union leaders; a few showed promise. “They have to be ‘hit’ some time or the other. 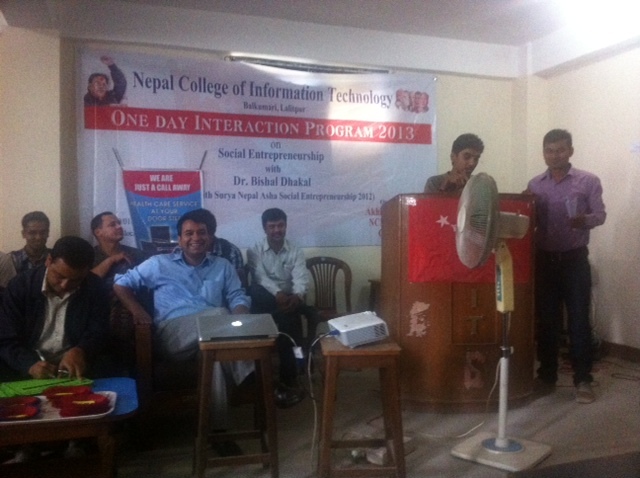 Some impact is made regardless of how it might look,” said Dr Dhakal as we discussed the event afterwards. This way at least when these young students hear of the word ‘entrepreneurship’ now, they’ll sit up and listen a bit more carefully perhaps.